Why is knife care important? Your knife is the tool you use most in the kitchen and when you give a little to your knives, they give a lot back! A sharp knife isn’t just faster and easier to use, it’s actually safer too. 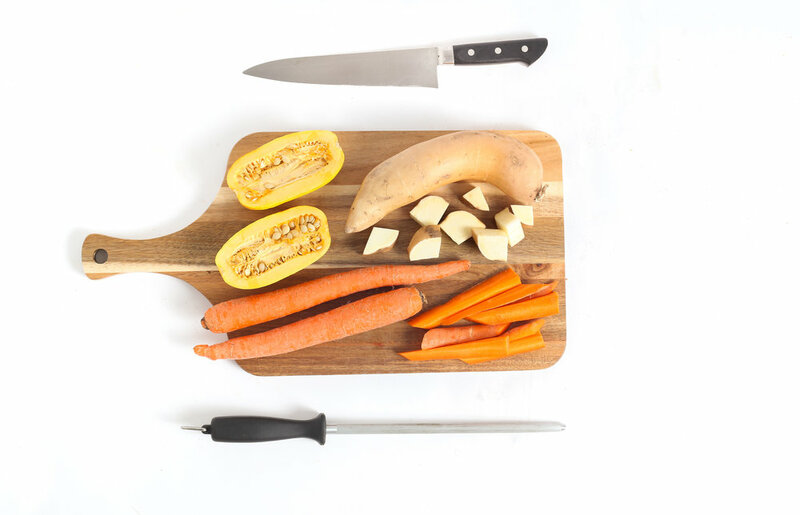 A sharp blade is much less likely to slip and cut you when you try to muscle it through a particularly stubborn sweet potato or squash. What type of cutting board should I use? The first rule of cutting boards is that you should never cut on a surface harder than a knife itself. That means ceramic, glass, and granite countertops are all no-nos since they can permanently damage your knives. Hardwood blocks are a great choice, but plastic is nice too since it can be easily cleaned and machine-washed. Your cutting board should be big enough so that you can lay your knife diagonally across it and have a few inches on either side so you have adequate space to cut and work. Tip: For your safety and the safety of your knife, resist using the sharp edge of the knife to scrape food off the board and into the pan. The scraping motion can quickly dull blades and cut fingertips. Instead, use a bench scraper or the dull back edge of the knife. How do I clean a knife? The safest way to clean a knife is to wash them by hand with hot water and a little soap, and then hand dry it. We don’t recommend leaving a knife on a drying rack since this can bang up the edge and makes it dangerous to get other things out of the drying rack. Can a knife go in the dishwasher? Please do not put your knives in the dishwasher as this can seriously damage them. How should I store a knife? A block or a magnetic strip is a fine storage solution, though the cheapest and easiest solution in our opinion is to keep them in a kitchen drawer with a handy edge guard securely covering the blade. What does that metal rod do for my knife? This fancy-looking chef trick of “honing” a knife just massages the blade so that the edge stays straighter and glides through food more easily. Pro cooks and butchers hone their knives daily if not hourly, but you can get by honing your knives once a week. While honing helps keep a sharp knife sharp, it cannot actually sharpen a blade. If your knife is dull (a good test is if it can slice through the skin of a tomato or bell pepper with no downward pressure) you really need to sharpen it instead of honing it. What do I need to know about sharpening my knives? While honing is merely straightening out the small imperfections that can develop in a blade, sharpening actually removes the metal on a knife’s edge, creating a new cutting surface. Depending on how often you cook, you should sharpen your cooking knives 1-2 times per year at a minimum. Most kitchen stores, knife shops, and many farmers markets offer professional knife sharpening and it’s worth every penny. You can also sharpen your knives at home and it’s a worthwhile skill to learn if you cook a lot. Whetstones are great for a more precise result and more expensive Japanese knives while electric/manual grinders are a faster, less precise solution for workhorse German knives.